Interesting Whatsapp Facts to blow your mind #infographic ~ Visualistan '+g+"
No other app rules our lives like WhatsApp does. But did you know that WhatsApp is way more than just another messaging app. WhatsApp has was started way back in 2009 by two ex Yahoo! employees who got tired of corporate hierarchies and wanted to do something revolutionary. 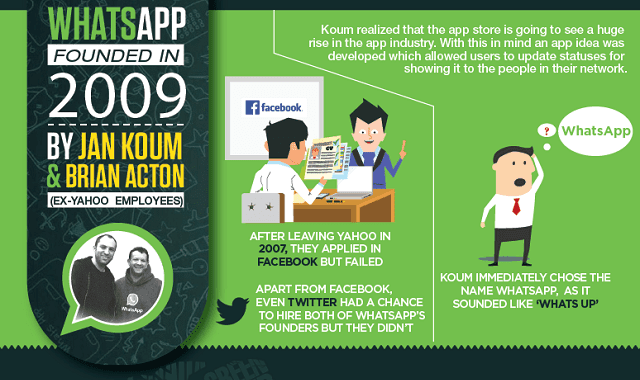 The road was not easy and at the beginning Koum and Acton did not had great ideas but they saw an opportunity when they realized how big App stores and smart phones are going to be in the future. Then they did what many people with ideas fail to do, they acted upon the opportunity and today the name of WhatsApp is on every person’s tongue. I bet people at Facebook and Twitter must be regretting their decision of not hiring the founders when they had the chance now. Facebook literally paid $19 billion for the app which could have been their own to begin with. Talk about bad decisions eh? Well in order to know more fun facts about the most loved messaging app in the world, follow the info-graphic developed by shoponless.com below: Let us know in the comments how you liked the info-graphic and if you know any other fun fact about the app, please don’t keep it to yourself. Share it with us and the world in the comments section.